Welcome to the Australian Reader's Digest Readers! 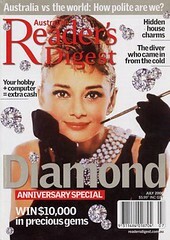 If you got here through the Diamond Anniversary Special of Australian Reader's Digest (July 2006 issue), let me just extend a warm blogging welcome to you. Thanks for taking the time to visit and check out this blog based on the article "Your hobby + a computer = extra money" by Louise Waterson. If you've never heard of the term blog before and would like to learn all about it, my site on About.com's Web Logs will be a good place to start. I have several information for blogging newbies right there. The best article to start reading is probably this: Top 10 Questions On Basic Blogging. To learn more about making money online, you might also want to check out my blog, Just Make Money Online. ShaiCoggins.com - This is my personal blog site, where you can also find some of my art work, musings, and links to other sites. Self Help Diva - Find inspiration, motivation and ideas on self-help, counselling and psychology. FreshWave.TV - One of the first and few video blogs based in Australia. I run this vlog with a good friend, Bern Relos. Shai in 60 Seconds - This is my podcast (audio) show that I haven't updated in a very long time. Chrysalis Creativity - As mentioned in the article, this is my blog for all things creative - from prompts to ideas to projects to mini-workshops. eMothersOnline.com - This is a collaborative blog that I run with several other women - mothers just like me, and even grandmothers. Our goal is to help empower, encourage and educate one another as mums in our society. If you have any questions or ideas, feel free to ask away by leaving a comment here or sending an email to shaicoggins@gmail.com.